Did you know visuals get 94% more views than text-based information or that structured presentations are 40% easier to retain than freeform information? With over a decade of experience in the presentation space, Ethos3 has learned that creating the perfect presentation requires more than just designing fancy slides. There is a science behind every great presentation, and it’s that science that drives our team to develop the perfect presentation for you. Take a look at this sneak peek into the science of presentations and how you can implement it today. With structured presentations being 40% easier to retain than freeform information, your content framework is critical. At Ethos3, we rely on our years of experience to help each client structure their information and develop a clear framework for the content they want to share. Looking to get started in structuring your content? Try this. 1. Tell them what you are going to talk about. Ideally use this step to highlight the three main points you are going to share. 2. Unpack your main points. This step will allow you to develop the narrative you are going to share. Use stories, visuals, and workshops to build the tension and support your message. Make sure you have data to support your message and can drive it home. Framework is important, so don’t skimp on it. And remember that your framework will change based on the presentation; what works for one, doesn’t always work for another, so remain flexible and pliable as you structure each presentation. People retain 80% of what they see, 20% of what they read, and just 10% of what they hear. With statistics like this, it’s important that every presentation be engaging on a visual level. At Ethos3, we have an expert team of designers who spend hours designing each presentation. They use their years of experience to create beautiful slides that tell a visual story to complement the presenter and the presenter’s message. Unsure of where to start with your design? Implement these 3 rules. 1. Keep your text to a minimum. Your slide should complement what you are saying rather than detract from it. Use big ideas and engaging callouts to keep your slides clutter free and easy to follow. 2. Use relevant imagery. 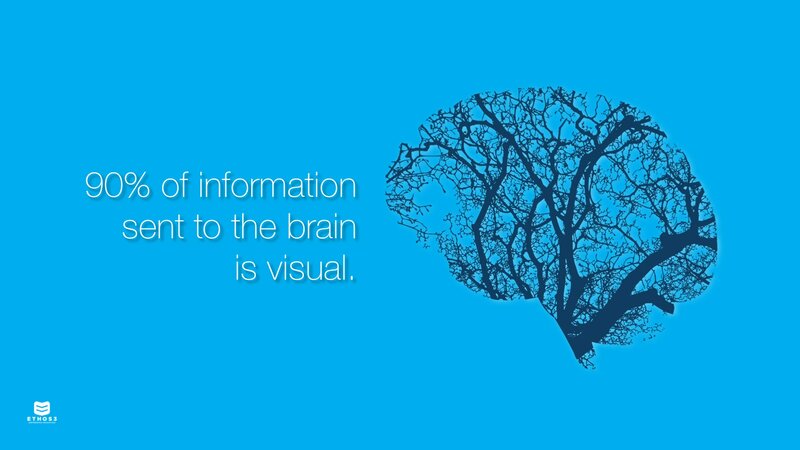 90% of information sent to the brain is visual. As a presenter, capitalize on that statistic and include imagery that is relevant and complementary to your content. 3. Keep it consistent. When it comes to design, it’s easy to let creativity create clutter. Fight the urge and keep your design clean and consistent. Use similar fonts and colors to keep everything cohesive. It’s not always about what you say, but how you say it. 85% of what an audience takes away is based on body language, mannerisms, and facial expressions. That’s why at Ethos3, we focus just as much on the delivery of your presentation as we do on the content and design. 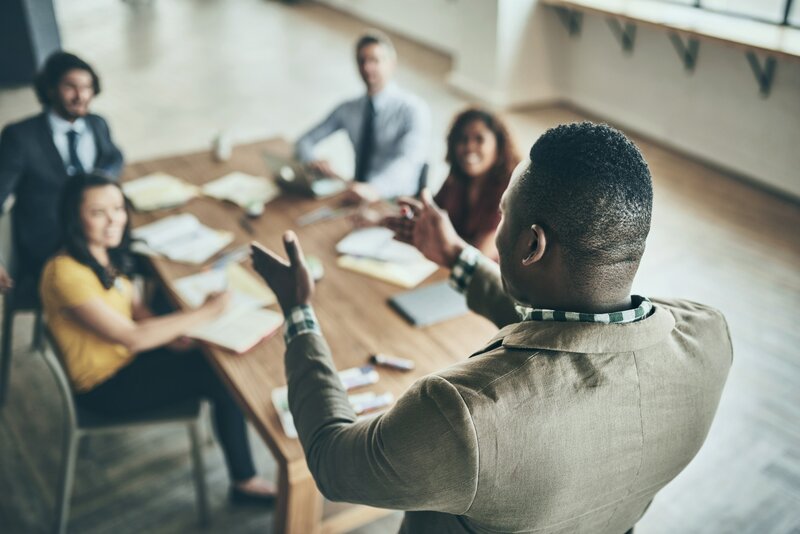 In fact, we’ve developed a comprehensive training program called Presentation Mentor to help all of our presenters elevate their delivery, because we know how important effective delivery is. Overwhelmed at the idea of delivering? Test drive these 3 tips. 1. Embrace the power pose. Power poses increase the level of testosterone by 20%, boosting confidence and motivation. They also decrease the level of the stress hormone cortisol by 25%. 2. Use your body. With non-verbal communication making up such a large part of communication, it’s important to use it to your advantage. Be sure to focus on and practice your non-verbal communication to enhance your next presentation. 3. Smile. This may seem like common sense, but a smile can go a long way with your audience. If you want to be perceived as a thought leader, you must be likable. In fact there’s a 1 in 2,000 chance you will be perceived as a leader if you are not likable. Ouch. So, smile; it could change everything. Effective presentations are rooted in science, and at Ethos3, we love to study the science behind them. If you can embrace just one or two of the above tips, you will take your presentation skills to the next level overnight. Give them a shot, and let us know how your next presentation is amplified! Want to learn more about the science of presentations and the Ethos3 process? Contact Michael today at Michael@ethos3.com or visit us at Ethos3.com.